IFFCO-Tokio General Insurance commenced its operations in December, 2000. 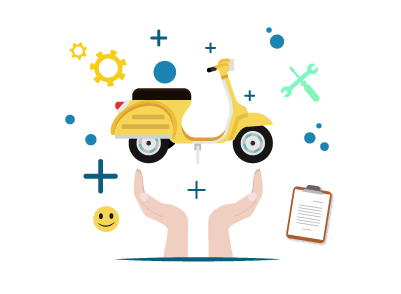 It is one of the leading motor insurance providers in India with a large customer base. The firm is a joint enterprise between the Tokio Marine and Nichido Fire Group, Indian Farmers Fertilizer Co-operative (IFFCO), and its associates. The firm serves its best to the customers via 78 Strategic Business Units, 400 Bima Kendras, and 171 Lateral Spread Centres (LSC’s) present in more than 350 towns. The firm’s large professional workforce comprising more than 1500 skilled individuals add to its credibility and reputation. The firm also has a good customer care team that promptly resolves grievances and answers queries. You can contact the customer care team on their toll-free number - 1-800-103-5499 or call on their landline number 0124-428 5499 (charges apply). You can also send an email to the team at websupport@iffcotokio.co.in. You can also register your query or grievance in the ‘contact form’ present on the official website of IFFCO-Tokio. New Delhi - 110025, Delhi, India. New Delhi - 110019, Delhi, India. New Delhi - 110034, Delhi, India. New Delhi - 110028, Delhi, India. New Delhi - 110019, New Delhi, India. 26, K.G. Marg, New Delhi - 110001, Delhi, India. Bangalore - 560043, Karnataka, India. Bangalore - 560052, Karnataka, India. Bangalore - 560058, Karnataka, India. Mumbai - 400021, Maharashtra, India. Mumbai - 400050, Maharashtra, India. Mumbai - 400059, Maharashtra, India. Mumbai - 400071, Maharashtra, India. Mumbai - 401101, Maharashtra, India. Mumbai - 400703, Maharashtra, India. Hyderabad - 500034, Telangana, India. Hyderabad - 500072, Telangana, India. Kolkata - 700071, Telangana, India. Kolkata - 700017 Kolkata, India.